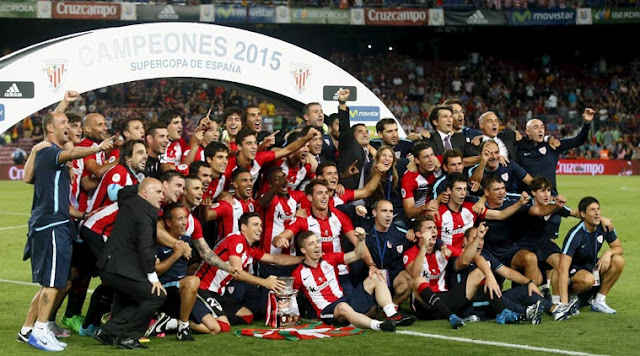 Yesterday, after the second leg of the 2015 Supercopa de España Athletic Bilbao joined a very small group of Spanish clubs; a group of now five sides that have won the Spanish Supercup on more than one occasion. After their 5-1 aggregate victory over Barcelona, Bilbao added this trophy to the one they had previously won back in 1984. The other sides that hold this prestigious record in Spain obviously include Barcelona and Real Madrid who had won the cup 11 and 9 times respectively. The other clubs that got to hold the trophy on more than one occasion are Deportivo La Coruña with 3 Spanish Supercups to their name and Atlético Madrid who only joined this group of clubs last year after winning the 2014 edition of the cup and are now tied on two cup wins with Athletic Bilbao. But who are the sides that may be joining this group in the next little while? Surely it's not the easiest task to win the Spanish Supercup unless you're Real Madrid or Barcelona, nonetheless, there are five clubs in Spain that had won the cup once before and will definitely be looking to raise the trophy at least once more. Here are the five Spanish football clubs that had won the Supercopa de España just once in their history (from most recent). 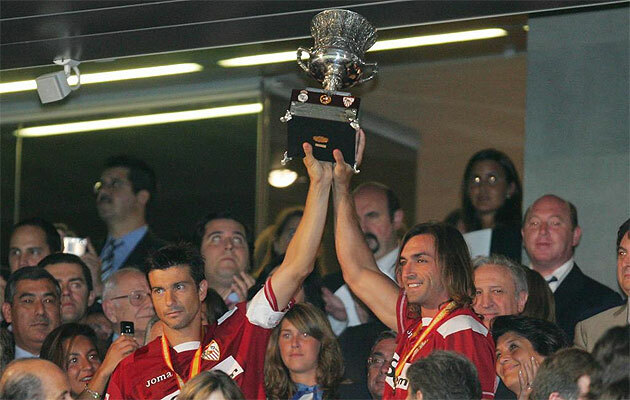 In 2007, Sevilla who had won the Spanish league just once in the clubs history in 1946 was drawn against league champions Real Madrid in the Supercopa de España after picking up their fourth Copa del Rey trophy. With Madrid the obvious favorites, Sevilla picked up a surprise 1-0 victory in the first leg on home ground thanks to a penalty goal from Brazilian striker Luís Fabiano. The slim margine of victory did not seem to worry the Madrid faithful all that much, that until the visitors took a quick lead in the second leg with another Brazilian (Renato) scoring just 16 minutes after the kick-off at the Estadio Santiago Bernabéu. When Madrid answered with their own goal to tie the game up, Renato scored once more, giving Sevilla another lead on course for a shocking 5-3 road victory and a 6-3 aggregate victory. 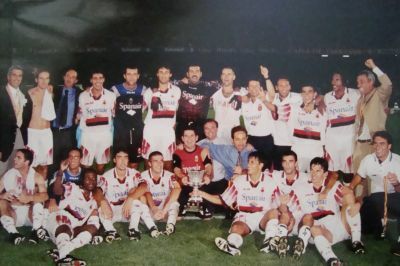 2004 saw Real Zaragoza try for a third time to capture the Spanish Supercup after failed attempts in 1994 and 2001. On the previous two occasions Zaragoza's opponents were Spain's giants Barcelona and Real Madrid, but in 2004 it was Valencia who had won the league the season before. The first leg went "to plan" and the Spanish champions Valencia left La Romareda stadium in Zaragoza with a 1-0 victory, but the reverse match in Valencia would shock the defending La Liga title holders. A South American duo in Brazilian defender Álvaro and Argentine defender Luciano Galletti would give the visitors a 2-0 lead at the half and despite Valencia's second half goal which tied the aggregate score at 2-2, Zaragoza's striker Javi Moreno would give his team the clear victory with a goal in the 83rd minute. After winning the Copa del Rey for the 1998-99 season, Valencia faced league champions Barcelona in the 1999 Supercopa de España. The first leg on home ground proved to be a difficult match, but one Valencia was able to take advantage in after Argentina striker Claudio López scored the game's only goal in the 86th minute. Interestingly enough, López's goal would prove to be the crucial decider as Valencia was able to come back and tie the match in Barcelona after the home side went ahead three times, with the match ending in a 3-3 draw and Valencia winning their only Spanish Supercup to date on a 4-3 aggregate score. A year before Valencia's Supercup victory Mallorca recorded what is likely the most impressive Supercopa de España win to date and what is still the club's only major trophy. After making it to the final of the previous season's Copa del Rey, Mallorca lost to Barcelona, but since the Catalan side had also won the La Liga title the same year Mallorca qualified to play in the Supercup final by default. 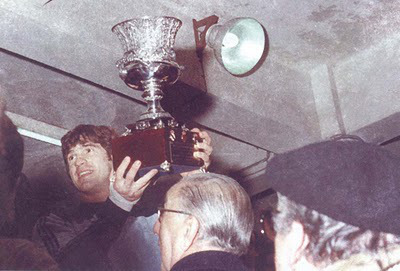 With the small island club having never won anything but the second tier prior to 1999 and Barca being the club that they are, few gave Los Bermellones a chance to capture the country's Supercup. But Mallorca would shock the nation as they defeated Barcelona both at home and away, coming out with the 3-1 aggregate victory after 1-0 and 2-1 wins. In 1982 Real Sociedad had won their second consecutive La Liga title; the only two Spanish championships they have managed to date. Their Supercup opponents were Real Madrid who managed to capture the 1981-82 Copa del Rey. After losing by a score of 1-0 in the first leg and unable to score at the half of leg 2, Sociedad's chances of claiming their first Supercopa de España seemed pretty slim. But just under 10 minutes after the second-half kick-off Sociedad's striker Pedro Uralde was able to put the ball in the back of the net and tie the aggregate score at one goal apiece. With neither team able to score before the final whistle the match headed to extra time and if neither were able to change the score would go on to penalty kicks. But before shootouts were even on the players' minds, Real Sociedad would go on to score three times in the extra frame, winning the cup on a 4-1 aggregate score.